Today is a little better than the day before. That’s pretty much the goal with these stays in the hospital. We found that out when we were here in 2012. Jenny has had more energy today. She even got up and showered. And she got out her computer and did some Christmas shopping. But she’s also felt worn out and nauseous at other times. They are pumping her with lots of medicine. She’s not taking Hydrocodone, though. She hates that stuff, so they’re giving her Ibuprofin to manage the pain that she still has. We saw two different doctors from Infectious Disease. They tell us that they are watching her blood tests and making sure the antibiotics are working. They are also waiting for the tests to return from the culture they took to determine the type of infection. That won’t return until tomorrow. That gives them more information to act on. We saw Katie, Dr. Kronowitz’s PA. She didn’t have a lot of information. She was between surgeries. They will know more tomorrow after another day of monitoring her metrics as she gets her antibiotics. We heard that part already. She did confirm that they will send us home with all the meds we need after they are certain the infection is under control. I took a class to re-learn how to care for Jenny’s PICC line. I take another one tomorrow morning and then have to prove my abilities in front of a nurse tomorrow afternoon. They are tough here … two classes and a test! 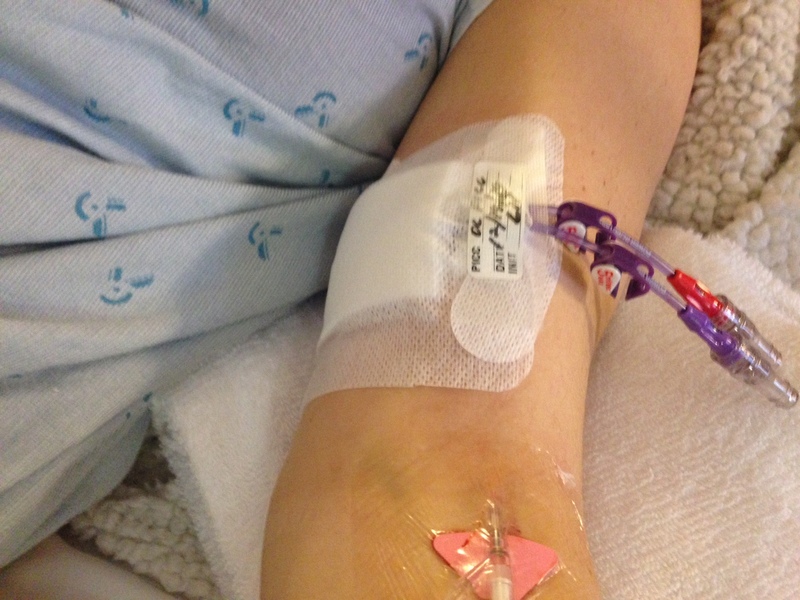 A team from the Infusion Clinic came in to insert the PICC line. Leading up to it, Jenny wasn’t nervous about it like she was a couple years ago. But when they got there, she was nervous. I didn’t get to stay — because they need a sterile environment — so I went to the waiting room and took this picture. It’s not exciting. It’s just the picture I took as I wrote this update. The procedure took 45 minutes. 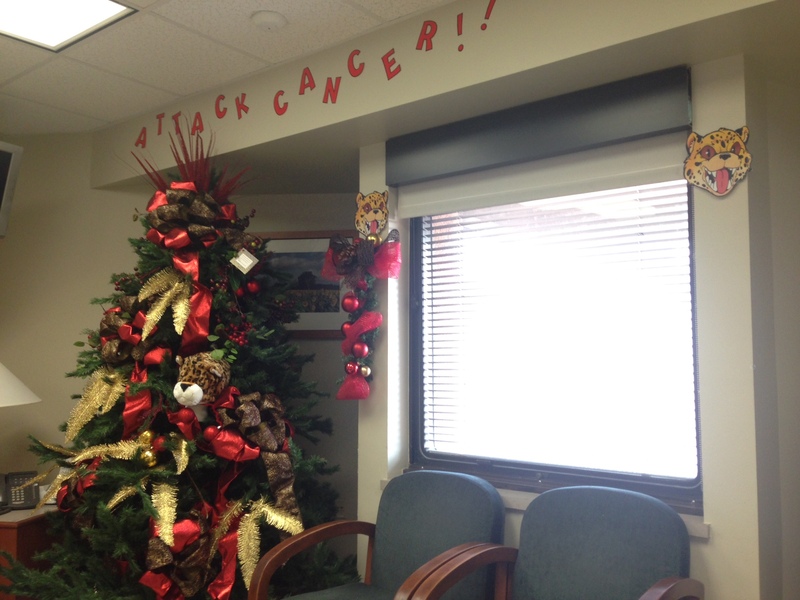 An enthusiastic nurse was decorating the tree for the big contest this week. She liked her jungle theme. Passers-by agreed with her. It’s looking more and more like it will be Wednesday before we go home. Katie said that Tuesday would be the ‘best-case scenario.’ She’s getting better, but I don’t know that Jenny is bouncing back at ‘best-case scenario’ speed. There’s also all the details about the PICC line tests and the home-health medicine and equipment that need to be delivered to us. If she’s getting released tomorrow, it will be pretty late in the afternoon tomorrow, I think. If that’s the case, we’ll take it. It’s good advice — surrendering our time table. Peace. Peace … even through this sound. That’s how Jenny subconsciously tries to control her own time table, I think. Maybe they’ll tire of coming in the room and just let her go? Alas, they fixed that by changing the IV to a PICC line and removing the IV. She has to surrender again. The PICC line. My job the next three weeks. Prayers for a speedy recovery & safe journey home. I’m available if you need help with anything. Ouch! Hope you get well soon. See you next week for Christmas! I love the look on Jenny’s face when the alarm is going off… Like – oh well. Deal. Hope you guys get sprung soon. Safe travels and holler if yall need any kid assistance!